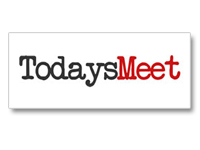 TodaysMeet is primarily a backchanneling tool that allows students to participate in synchronous or asynchronous discussions in virtual classrooms created by instructors. to bring the number of connections down below 500. This online tool can be used in a variety of ways to encourage students’ engagement in class. It is very easy to use, even for beginners. TodaysMeet offers both free and paid services, depending on the needs and financial means of the user. The free service offers basic functions to backchanneling a class discussion. One commonly seen problem in a classroom is that some students might feel uncomfortable sharing their ideas. TodaysMeet offers an opportunity for all students to voice their ideas in writing, which encourages more active participation from the entire class. It gives a revenue for the teacher to hear from everyone and also allows tangent topics to happen at the same time as the main discussion. Additionally, the conversations that happen in a TodaysMeet classroom are saved temporarily in a transcript so that teachers and students can review and analyze the conversation after the discussion. It does not provide face to face experience for interpersonal learners. It is hard to be used for math discussion when equations and mathematical symbols are involved. Privacy wise, it seems that for the free account, the ability to control who can participate in the discussion is limited. There are only two choices, either accessible to anyone or those who are logged in users. If I want to limit the participants to be only the students, then I’d have to upgraded to a paid account. Substitution: Students engage in a discussion on TodaysMeet (rather than having them engage in a discussion in class). Augmentation: Students can engage in a week-long conversation with classmates outside of class time. Modification: Students can critically analyze the transcript of the discussion. Redefinition: The teacher and students can invite community members, experts, and other classrooms to join an in-class backchannel or an ongoing conversation about a topic. Math: TodaysMeet can also be used as a virtual visual classroom for guest speakers, or a place to hold online office hours, etc. Students can collaborate to write research paper in the virtual classroom. Discuss an abstract idea without using specific math symbols. It allows students to expand the discussion to related topics which cannot be addressed in class due to time constraints. Science: Collaboratively research on a topic, then write research report and use links for videos, articles, pictures, useful website to enrich the presentation. While watching an educational video, conduct a silent discussion on the side in TodaysMeets, or post questions. English/Language Arts: Discuss a book over a week or two. Invite an author to talk about his/her book asynchronously with the class. Other: Use TodaysMeets classroom for online office time, Can be used to create online class community by inviting students in other places to join the discussion.